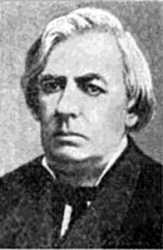 Jakiv I. Schogolev (24 Oct (5 Nov) 1824 – 27 May (8 Jun) 1898) – Ukrainian poet. Born in a town (now – the district center of Sumy region) in the noble family. He studied at the district school in Okhtyrka (1832 – 1835), Kharkiv High School (1836 – 1843), Kharkov University (1843 – 1848). At university he met with professors A. L. Metlynsky, N. I. Kostomarov, I. I. Sreznevsky, that greatly influenced the formation of his views. Then he served in Kharkiv as petty officer, in 1871 resigned. He died in Kharkov. Schogolev wrote poems from early youth – his first works were published in 1840. A number of Ukrainian poetry was published in 1843 in the anthology "Molodyk (New Moon)." Much later were published collections of his poems "Vorskla" (1883), "Slobozhanschyna" (1898), which are its main achievements. Kaspruk A. . Sketch of the life and creativity. – Kyiv: 1958.